In an article reviewing the film Borat1, the late Charles Krauthammer decried the disturbing resurgence of anti-Semitism. He noted that the most significant anti-Semitic activity “since the Holocaust” had hit Europe – including formerly benign places like France and Norway. In the Middle East, hatred of Jews is white-hot. Iran is close to obtaining nuclear weapons, with the stated objective of wiping out the entire nation of Israel. Jewish filmmaker Sacha Baron Cohen evidently believed that the real anti-Semitism was…where? In Arizona! (Of course. How could we have missed it?) 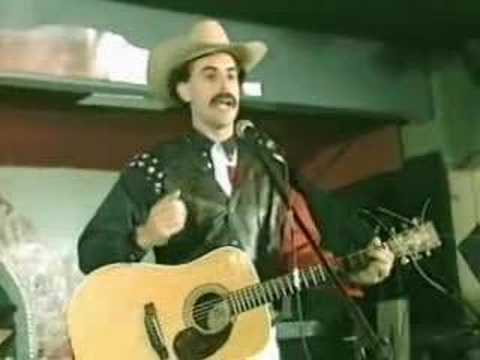 Borat has drunks in an Arizona bar singing, “Throw the Jew down the well.” (No indication of church-affiliation.) Mr. Cohen believed he was showing us the “true danger” – possibly even a budding Holocaust. Why do Jews have so much trouble distinguishing their friends from their enemies? Exit polls showed that Virginia Senator-elect James Webb’s narrow 2006 win over Senator George Allen included 92% of 51,000 (i.e., 47,000) Muslim votes. Mr. Allen lost by only 9200 votes, so Muslims were certainly the winning margin for a new Democratic senator. In that same year, Muslims in Minnesota’s liberal 5th District also helped elect Keith Ellison as the first-ever Muslim Congressman, by a 56% majority. A self-described “moderate,” Mr. Ellison was backed by the National Jewish Democratic Council, although his Republican opponent, Alan Fine, was Jewish himself. Muslim voters were flexing their new muscles. This year Rashida Tlaib (D-Michigan) and Ilha Omar (D-Minn,) entered Congress as the first-ever female Muslim representatives. Ms. Omar immediately created a stir when she charged that the American Israel Public Affairs Committee (AIPAC) pays politicians to support Israel. Some congressional Democrats immediately rose to condemn this hoary trope (first mentioned in the Dead Sea Scrolls, I believe), but the condemnation was by no means unanimous among Democrats. Ultimately, the Democrat-controlled House of Representatives passed a tepid resolution which condemned all “hateful” speech, without mentioning Ms. Omar by name. Some commentators tried to tie Rep. Omar’s anti-Semitic remarks to “hate speech” supposedly delivered by President Trump, but the attempt gained no traction. (Mr. Trump’s successful business-career renders laughable any attempts to brand him as anti-Semitic.) Others admitted that Rep. Omar’s charge about AIPAC was inaccurate, while arguing that a “meaningful conversation” about the USA’s Israel-policy was necessary and overdue. Rep. Omar has apologized for her remarks, yet she continues to issue anti-Semitic statements about Jewish influence. The split over Jews in the Democratic Party is obviously growing. Milton Himmelfarb famously said, “Jews earn like Episcopalians and vote like Puerto Ricans.” Indeed, Jews instinctively support ethnic minorities. All through the 20th century, American Jews helped empower minorities inside the Democratic tent. This remained true even while southern segregationists and avowed racists ran the Democratic Party. 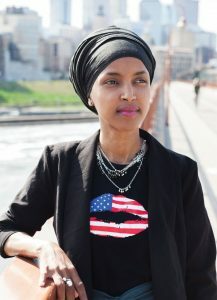 Rep. Omar’s outspoken attitudes show that a growing Muslim minority is now thronging the Democrat-tent. Estimates of Muslims in America range as high as four million. Political analysts agree that they lean decidedly Democratic, but their interests conflict with Jewish interests – especially over Israel. Thus, polar opposites again occupy the Democrats’ Big Tent. Why are American Jews hanging on as Democrats? 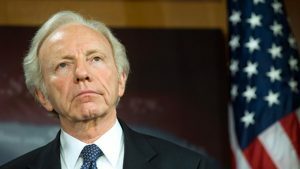 Then there was the curious case of Joe Lieberman. In a bitter 2006 Connecticut primary contest, Mr. Lieberman – a popular three-term senator and former vice-presidential candidate – lost the Democratic nomination (52% to 48%) for his seat to Ned Lamont, a political novice who had previously held no office higher than councilman. Mr. Lamont ran against the Iraq war. Senator Lieberman had strongly supported the war because he saw it as critical to Israel’s survival. When it became clear, early in the primary campaign, that Mr. Lamont had considerable support and might win the nomination, Mr. Lieberman declared that he would run as an Independent if he failed to win his party’s nomination. He followed through on that promise the day after Mr. Lamont’s victory. High-level Democrats shunned Mr. Lieberman and denounced him for his independent run. Some said he might hand the seat to the GOP. As an Independent, Senator Lieberman led in all polls throughout the campaign and won a clear general election majority over both Mr. Lamont and the Republican candidate. Formerly hostile Democrats oozed bonhomie and warm congratulations for his victory, signaling that they would welcome him back to the Senate Democratic Caucus. What was the deal with Joe Lieberman? When they realize that Democrats are no longer their friends, where will Jews go, politically? Perhaps the memories of rich Republicans excluding them from country clubs are still too fresh in Jewish minds to let them join the GOP. Or maybe they simply don’t feel comfortable sharing a “big tent” with devout adherents of another faith. I have no idea. But if Republicans are smart, they will make every possible effort to extend a welcoming hand to these folk who have done much for this country, and who will do still more in the future. Certainly Jews can be stubborn and contentious – a “stiff-necked people” the Bible calls them. (Having a Jewish branch in my family tree, I know what I’m talking about here.) But it’s important to remember that when we speak of “Judeo-Christian” ethics and morality, “Judeo” is part of that title. Jews have exercised a significant influence for decency, law, justice, and righteousness on our nation since its founding. I don’t personally agree with all of their politics, but there’s no denying that in matters of orderly living and sound governance, they didn’t just fall off the turnip truck. That declaration suggests that our just and decent treatment of Jewish people has been a major factor in our nation’s success. And it also explains why countries who have mistreated them have endured such terrible destruction. We’ll do well to remember it. Dr. Solomon is senior pastor of McLean Bible Church in McLean, Virginia.